As the kids practically bolted from my door when the bell rang, I felt a wave of mixed feelings wash over me. The night before our last day, I was picking up the room and making end of the year goodie bags for the kids and then it hit me. They would be leaving me tomorrow: leaving me to go on to another teacher next year, to learn different things, to be in a class with different students. My eyes started to water at the thought of them not being “my” students anymore. What an amazing group I had. They reminded me what it was like to be a kid again. They were always so full of laughter with big, bright smiles plastered all over their faces. Having them as students reminded me of how simple life can be. They reminded to smile and to have fun (as well as to make life fun). Sitting here a day later after my first official day of summer break, I am left with thoughts of excitement for next year, reflections on the past year, and feelings of bewilderment that I have the next two months to myself. Freedom at last. Time to take a breath after along, busy, and emotional year. I plan on catching up on my reading, doing lots of cooking (as well as eating), relaxing, and just making the most of every opportunity that comes my way. At some point(s) I also have plans to get my toes into the hot sand at local beaches. This vacation is making me feel like a kid again. I’m smiling on the inside just thinking about all the adventures to be had. There are so many possibilities. What are you looking forward to this summer? Aside from enjoying the start of my summer vacation, I made what I deemed the summer version of meatless shepherds pie. I could not keep myself from stealing a few extra bites, even after I was full. I had some as leftovers and it made for tasty lunch leftovers. 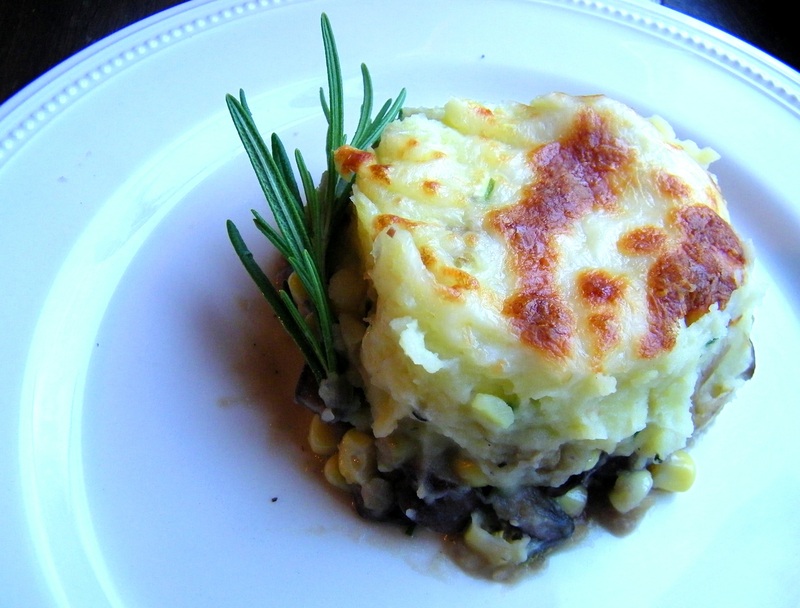 Cheers to a delicious meatless shepherds pie and to the start of summer. Heat a water in a medium-large pot over high heat. When the water begins to boil, add the potatoes. Let them cook until tender or for about 7-10 minutes. When they are finished strain them, then put them back into the pot and add the rest of the ingredients. Mix well and then use a potato masher or an electric mixer to blend it all together. Heat a sauce pot 3/4 of the way full with water over high heat. When the water comes to a boil then reduce the heat to medium high and add the lentils. Cook them until tender or for about 10 minutes. Remove and drain the lentils. Set them aside. Heat the olive oil for the mushrooms in a frying pan. Then add the garlic. When the garlic begins to brown add the mushrooms and stir with the garlic and olive oil. Let the mushrooms cook for about 5 minutes. Then add the spices and rosemary. When they are completely tender, then add the lentils. Mix well. Once that is combined add the red wine. Let the mixture simmer for another few minutes before taking it off the heat. Add about one tablespoon of water to the bottom of a sauce pan. Then add the corn. Heat over medium low heat and add the rest of the ingredients (garlic powder, salt, and pepper). Take off the heat when the corn is heated through. Before assembling, preheat the oven to 375 degrees. In a 8 x 8 pan or medium round pan, put the mushroom mixture at the bottom. Then layer the corn mixture on top. Spread each layer with a spatula to smooth it out. Then add the potato mixture on top. Smooth it out with the spatula again. Then if you choose, add the cheese on top. Bake for about 20 to 25 minutes or until the cheese melts or the top begins to brown. Bon appetit! Thank you & I agree 🙂 That is just the nature of the job I guess and I certainly won’t complain about having a summer break! Oh, I’m so glad to have your feedback! Sometimes I make things and then wonder if I’m the only one who enjoys the recipe. Glad to hear it tasted great for you too!